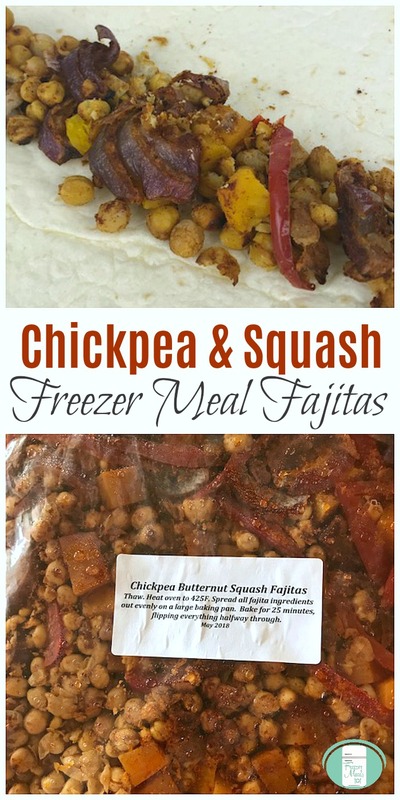 These chickpea butternut squash fajitas are a vegetarian freezer meal. They are colourful. They are healthy. 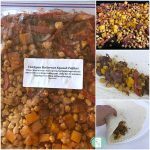 These are also gluten free if you use gluten free tortillas to wrap them in. 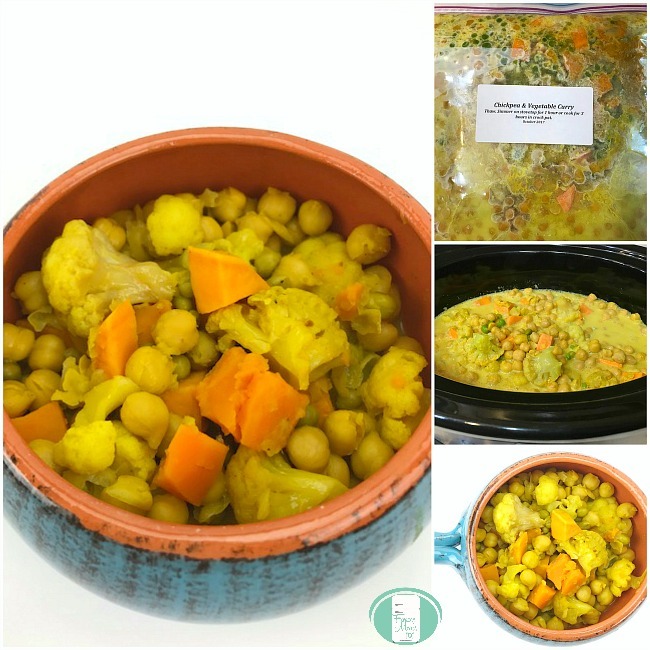 Place the squash, chickpeas, onion slices, red peppers, minced garlic, sugar, spices, olive oil, and lime juice in a large resealable freezer bag. Give the bag a shake to mix things around. Seal the bag after taking out the excess air. Freeze. On the day of cooking, take the bag out of the freezer to thaw. Spread the bag contents out evenly on a large baking sheet. Bake at 425° for 25 minutes, turning over with a spatula halfway through cooking time. 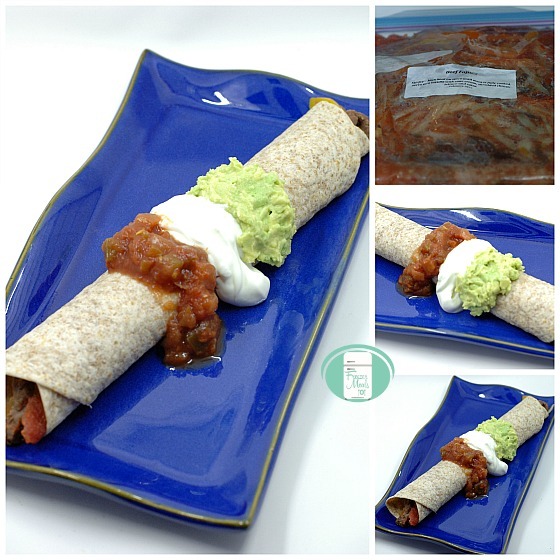 Serve warm on flour tortillas with Greek yogourt or sour cream, diced avocado, salsa, and a sprinkle of fresh cilantro. 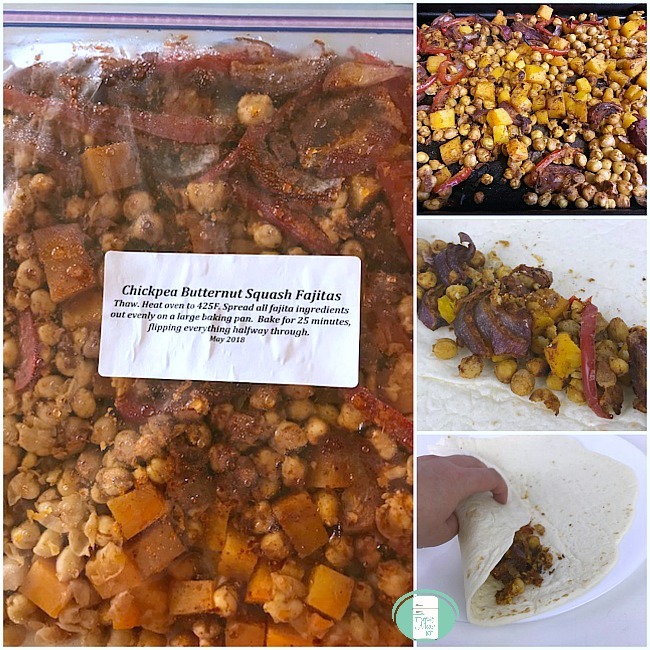 Place the squash, chickpeas, onion slices, red peppers, minced garlic, sugar, spices, olive oil, and lime juice in a large resealable freezer bag. Give the bag a shake to mix things around. Seal the bag after taking out the excess air. Freeze. Serving suggestions: Serve warm on flour tortillas with Greek yogourt or sour cream, diced avocado, salsa, and a sprinkle of fresh cilantro.